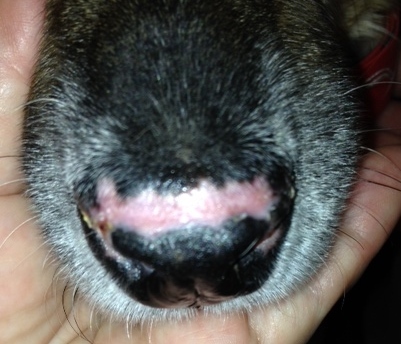 Discoid lupus erythematosus (DLE) is an autoimmune disease seen in dogs. It occurs when the dog’s own immune system reacts to free DNA. It is commonly seen in collies hence the common name ‘collie nose’. People with a background in Latin are probably wondering why the word lupus which is Latin for ‘bite of wolf’ is included in the name. Since collies were used to protect sheep from wolves, it was thought that the condition was caused by a wolf bite. DLE usually affects the nose but may also strike the ears and mouth. The first sign is often when the nose changes from black to gray. Next, the nose starts to blister and crack until most of the normal tissue is gone. The dog is left with on open painful wound. 1) Keep the dog inside during the day as sunlight exacerbates this condition. 2) Doxycycline and niacinamide work together to suppress the immune response. These two drugs are the mainstay of therapy. 3) In really severe cases, short term steroid therapy may be required to control the immune system. 4) Fatty acids, especially omega 3, combined with vitamin E help decrease the immune response. In some patients, therapy with omega 3 fatty acids and vitamin E dramatically decreased the required dose of doxycycline and niacinamide. Source: -Brooks, Wendy. Discoid Lupus Erythematosus. The Pet Health Care Library, Client Education, VIN. a stray puppy was found with open wounds, no puss, no foul smell, looked like cut wounds around the body. The vet looked at it, made injections of glucose, Dexamethasone and one more drug, the wounds were covered with clean cloth and tightened. 3 days later the puppy had her skin coming off of her flesh everywhere, even near the eye sockets. The vets stitched her up but she never woke up from the surgery. The puppy was kept indoors all these days. On pictures it looked like it was skinned alive. What do you think can cause this? This happened in Russia and the vets that looked at the puppy could not figure out what could have caused the skin to come off. I also have pictures and a video of the puppy in that condition. Please let me know if you can help me with your suggestions. Wow, that sounds like a really unusual case. I can’t image home much pain this puppy was in. My first thought is some kind of a flesh eating infection however, these wounds usually smell horrible. I have seen pups with defective skin that peels off when touched but that would not explain the cuts. Perhaps this pup was the victim of animal cruelty? Can you post a picture? Thank you for your reply Dr. Nelson. Sorry for too many relies. I really appreciate that you replied to me and provided your opinion. I am sorry for the slow replay as I was on a mini-vacation with friends. I have seen several cats with wounds and a history like this from what we call ‘fan belt injuries.’ The animals crawl into a car engine for warmth and then get caught in the belt which causes severe injuries like they ones pictured. I have also seen these injuries in animals caught in conveyor belts or other types of machinery. The belts tear the skin from the underlying tissue which disrupts the blood supply. A few days later, large areas of skin slough off. In my experience, these animals also have other internal injuries that are severe. I am guessing that is the reason the puppy did not survive the anesthesia. Hope that helps! Hello Dr. Nelson! Thank you for your reply! It is very helpful! I will translate to the person who took care of the puppy what you said. Hopefully it will bring a peace of mind to her. Thank you again for your help and replies! It means a lot!